Full length native Sheep whole (purified). Our Abpromise guarantee covers the use of ab6896 in the following tested applications. ab6896 has not yet been referenced specifically in any publications. Publishing research using ab6896? Please let us know so that we can cite the reference in this datasheet. I used this antibody to detect sheep anti tyrosine hydroxylase (TH) labelling of splenic nerves in mouse spleen sections along with rat anti-CD35 labelling of follicular dendritic cells (FDC) and rabbit anti PrP labelling of prion protein. It was diluted 1/200 for use on frozen sections that were fixed in acetone and blocked with serum for 30 mins at room temperature. 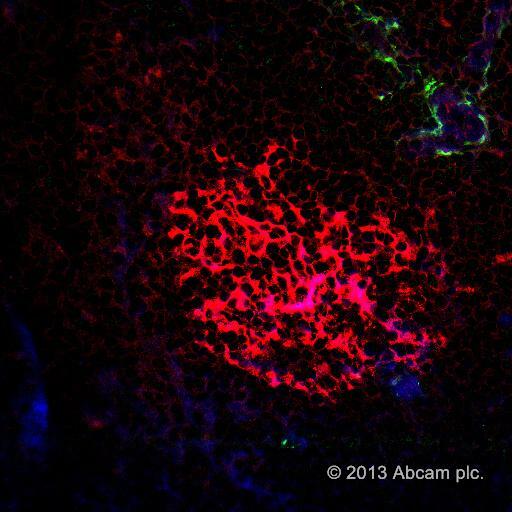 I chose this antibody as I found it difficult to find secondary's that were anti-sheep. I was concerned that the FITC might bleach during confocal microscopy however I was able to scan the triple labelling without any bleaching occurring. We have already ordered antibodies from other company. I just asked my boss. You can refund our money on our account. Nice to contact with you and thank you very much for your help! I am sorry that these antibodies did not perform as stated on the datasheet. If payment has already been made on the original order and you wish to receive a refund, please ask your purchasing department to contact our accounting department so that we may gather the correct information needed for the refund. To avoid confusion, please ensure your accounts department is aware of how the credit note is being used. Our accounting department can be contacted by email at us.credits@abcam.com or by telephone using the information at the Contact Us link in the top right corner of our website. Please refer to the credit note ID in any correspondence with our accounting department. The credit note ID is for your reference only and does not automatically guarantee the credit. I hope this experience will not prevent you from purchasing other products from us in the future. Our Scientific Support team is always at your service, should you require further expert advice. Yes, the image of DAKO gfap staining is the typical astrocyte, just as the image of instruction your company provided to us with ab90601 antibody. So, you can see the significant differences! Thanks for your reply. I am very sorry these anti-GFAP and anti-MAP2 antibodies continue to give you trouble. I'd be happy to send you any two replacement antibodies from our catalog. Or if you prefer I can set up a credit or refund instead. Please let me know how you would like to proceed. to whom may be concerned: our lab ordered four antibodies from your company in July. we cannot find the order list now. ab90601 sheep polyconal to GFAP. ab11267 mouse monoclonal HM-2 to MAP2 - neuronal marker and other two secondary antibodies: ab6896 Donkey polyclonal secondary antibody to sheep IgG - H&L(FITC) and ab47052 Goat polyclonal secondary antibody to Mouse IgG - H&L(AMCA). we used the GFAP to stain astrocyte of rat brain frozen sections and MAP2 to stain neuron of rat brain frozen sections. However, we found the images of GFAP staining were very similar to neurons, clearly not astrocytes. we repeat experiment at least three times and obtain the same results. last time, we borrowed GFAP antibody from other lab ( DAKO company product ) and followed the same procedures and make comparison with your company's GFAP. We obtained typical image of astrocyte by GFAP of borrowed antibody (DAKO product). However, for your company's GFAP, we obtained images similar to neurons just like before. Besides, for the MAP2 of your company, we cannot get any typical images of neurons although we followed the same procedures as doing GFAP. For every experiment, we made negative controls. Finally, we believe there must be somthing wrong with your two primary antibodies(GFAP and MAP2). It cost us more than two weeks to do such experiments which made us very frustrated. We just want to proceed our experiment quickly. so IF possible, someone can check it for us and send us the right antibody quickly so we can continue our experiments. We spoke just a short while ago regarding these issues you were having with ab90601 and ab11267. I have processed the replacement orders as we discussed and sent you an update via email just a few minutes ago. You should receive these 2 replacement antibodies for ab90601 and ab11267 tomorrow. I am sorry for the trouble these 2 antibodies have caused and I do hope the replacements work as expected. Please feel free to follow up with me if you need anything further.